I want to adorn every corner of my house with fall leaves, painted pumpkins, owls, witches, and black cats. Now that I have my Halloween mantel ready to go (you can see examples here.) It’s time to get out my mums and do some pumpkin painting! 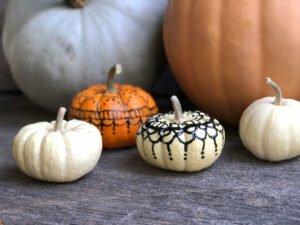 One of my favorite things to do each October is to come up with cool and interesting new ways to decorate and paint a pumpkin for Halloween and/or Thanksgiving. 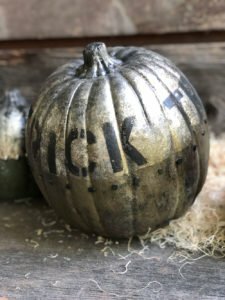 I’ve assembled some of my favorite “no-carve” pumpkin ideas that will be sure to get your creative juices flowing. 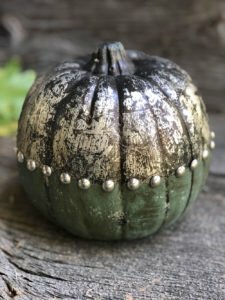 I painted these foam pumpkins black and then covered them with silver foil and chalk paint at the bottom. 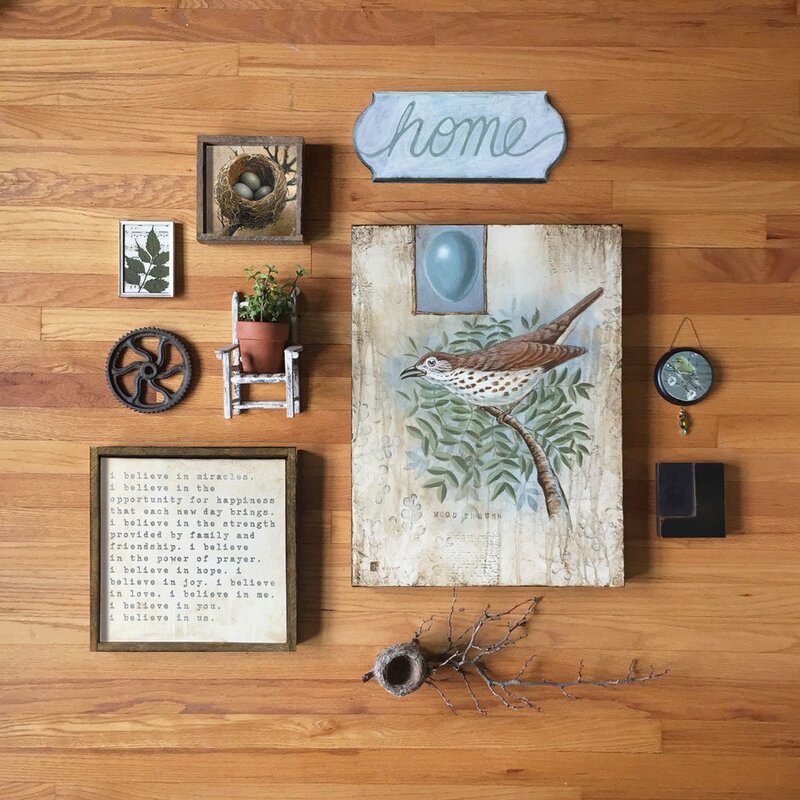 Stenciled letters and furniture tacks along the center give them a trendy industrial look and feel. 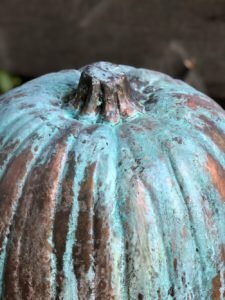 The pumpkins pictured below were primed with black paint followed by copper leaf sheets and Modern Masters reactive copper paints. 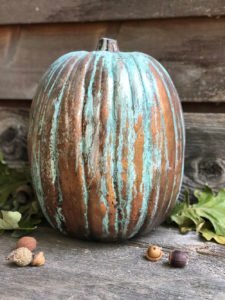 Modern Masters reactive paints were used on this pumpkin to give it the look of aged copper. 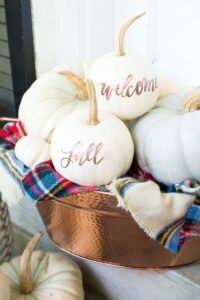 These pumpkins from Laura Cooper Calligraphy are painted white and feature hand-lettered calligraphy. 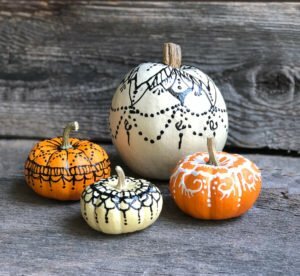 I was so inspired by these henna and wood burned pumpkins featured on the free people blog that I decided to make some myself! 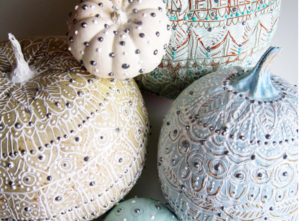 These pretty painted pumpkins were found on Alisa Burke’s blog along with an awesome tutorial on how to make them. 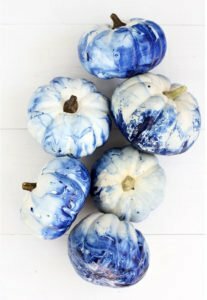 How much do you adore these marbled indigo pumpkins? Check out a terrific step by step tutorial on how to make them on Alice and Lois. This simple idea from shopterrain.com is a simple and beautiful way to use pressed flowers. 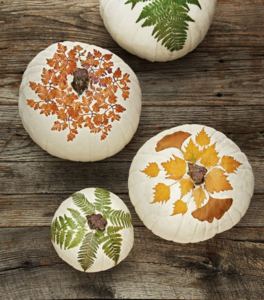 Use mod podge to adhere them to your pumpkins! LOVE!! 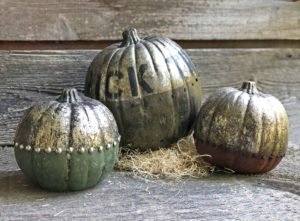 Whether you use real or craft pumpkins, all of these wonderful ideas are sure to become fall favorites! 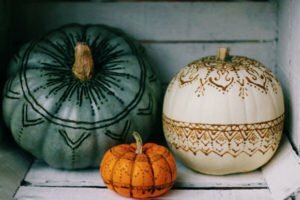 Do you have a unique idea for your pumpkin this year? Let me know in the comments below. 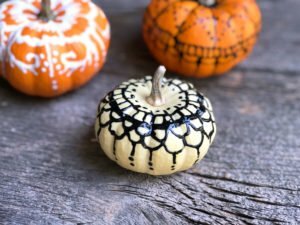 And don’t forget to join me Friday, October 20th for a henna pumpkin painting demo LIVE on Facebook! If you miss it, you can check out the replay at your convenience.